I honestly was trying to come up with a good title, and nothing came to mind. I got to thinking about how my timeline on Facebook is loaded with insightful messages, that are pretty repetitive and useless. You know them, the inspirational ones, with backgrounds of sunsets, seashores and nature in general. So, I decided to cut it out, and not put anything insightful instead. That brings me to, (I don’t know why it does) my weekend of drawing. Yesterday, it was a hot, humid day…made for sitting inside and drinking iced coffee or something stronger. 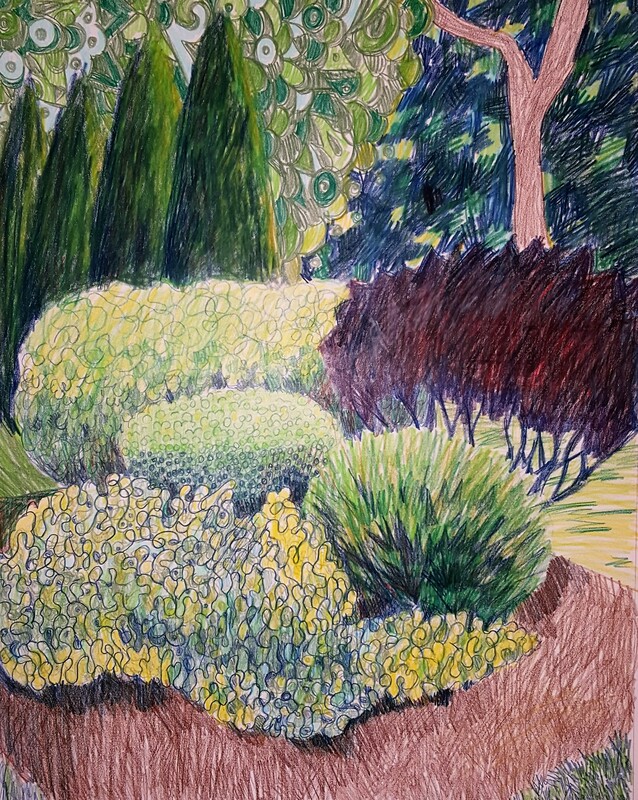 So, I did this drawing, “A Shrubbery Composition”. Not particularly insightful, but hey, you gotta keep at it. We did go for a ride, and ended up in a town park…beautifully natural, and very few people. Rare these days. Drawings will be coming up.